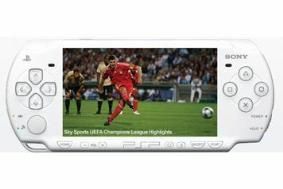 UEFA Champions League now available on Sony PSP | What Hi-Fi? Following the League's kick-off this week, PSP owners can transfer highlights from Sky Sports matches to watch on the go, or wherever they want. Throughout the new season, Go!View customers will be able to watch highlights from all 125 UEFA Champions League matches. In addition, last year's final will also be available so that supporters can re-live the highs and lows of the Manchester United vs Chelsea match. Action from Sky Sports' coverage of this season's Barclay's Premier league is also available on Go!View. The footie content on Go!View is available as part of the monthly Sports subscription pack which includes cricket, golf, boxing and extreme sports. New Go!View customers can get a one month trial subscription to the Sports pack, as well as two other subsciption packs – Comedy and Entertainment – free. Subscription packs cost £5/month for one pack, £8 for two and £10 for three.